He ran his hand through my hair and stared into my eyes. Neither of us spoke, just stared, for the longest time. And I'm pretty sure if, years from now, someone were to ask me the moment I knew I was falling in love with Griffin Burke, it was right then. Squeeeee! Cuteness overload! I'm used to N.R. Walker feeding my addiction to angst, but I love this change of pace! I'm pretty sure she has lighter fare in her back list, and I've got one on my tablet that I suspect is exactly that (The Weight of It All--the ebook and the audiobook! ), but her latest release was the first time I had read something of Walker's that was so fabulously adorable that I had a perma-smile on my face for most of this book. 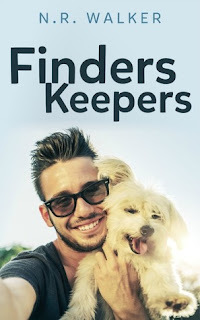 From how the main characters become entangled in each other's lives to how they make everything work, I'd be hard-pressed to find a single thing about Finders Keepers that I did not love. Oh, and did I mention there's a dog in it?! The move from Brisbane to Coolum Beach was exactly what twenty-four-year-old Griffin Burke needed. He's looking forward to the challenge of his new job in an industry he enjoys and his landlady is gloriously quirky and an unapologetic pothead. When he comes across a dog caked in mud and grime, Wicket the pooch's tag has him immediately dialing the number. However, Dane Hughes isn't able to pick Wicket up, no thanks to being stuck at a week-long conference elsewhere. Griffin offers to keep Wicket temporarily, and over the next few days, through calls and texts, the two men form a promising connection, but will it carry over to the real thing when they meet? Learn more about N.R. Walker. Purchase Finders Keepers on Amazon.